As Catalonia continues to make headlines fighting for independence from Spain, a new report has identified the region and its capital city as an entrepreneurial powerhouse rich with technology-focused startups and talent. The northeastern part of Spain is home to approximately seven and a half million people, with many of them living in it capital, Barcelona. The city has produced 1,000 tech startups, according to Startup Genome’s Barcelona Startup Ecosystem Report released on Oct. 19. Its startup ecosystem is valued at approximately $6.4 billion dollars (USD). 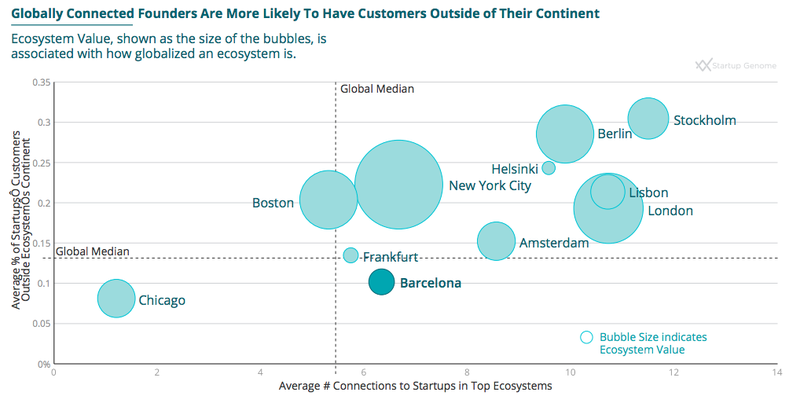 The report highlights three foundational areas where Barcelona excels and builds from: its global connectedness, a lack of startup leakage, and startup experience. attract other people to visit. It also mentions that one-third of startup founders in Barcelona have at least two years of experience as startup employees, which is “about 25 per cent higher” than the average for other cities in a similar position. Barcelona, known for its lively beaches, beautiful parks, and stunning historical art and architecture, has made a name for itself in the smart cities, biotech, and gaming industries. In fact, Startup Genome points out that the smart city sector represents as much as three per cent of Catalonia’s gross domestic product (GDP), and this strong performance has resulted in Barcelona being named the top Global Smart City in the world in 2015. There are approximately 270 smart city companies in Catalonia, employing over 116,000 and with total annual revenue of roughly $8.2 billion dollars, the report says. The five biggest Spanish pharmaceutical companies are also located in the Catalonia region, including Grífols, a Fortune 2000 company. 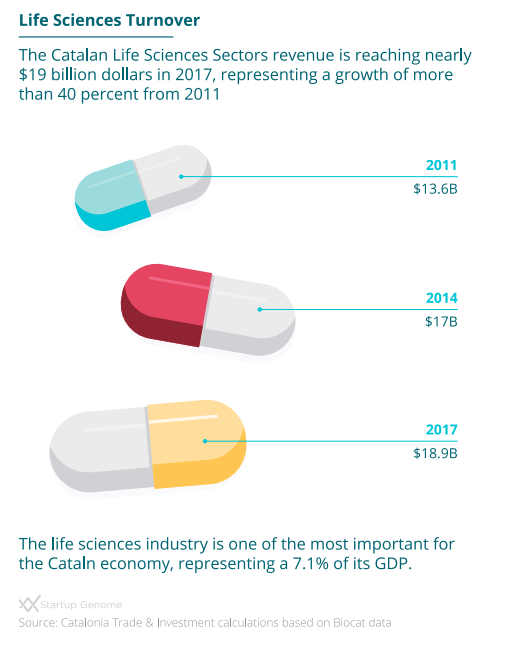 “The region includes 870 companies in the broader life sciences sector, with a total of nearly $19 billion dollars in total revenue per year,” the report says. It is also home to 120 video game companies, which accounts for 25 per cent of the total amount in Spain. Their annual sales equal approximately $256 million (42.5 per cent of Spain’s total). The report also showcases that tech exits – acquisitions or public offerings, which are one of the main ways startups return money to investors – have quadrupled in the last four years, from five to 21 exits per year between 2012 and 2016. 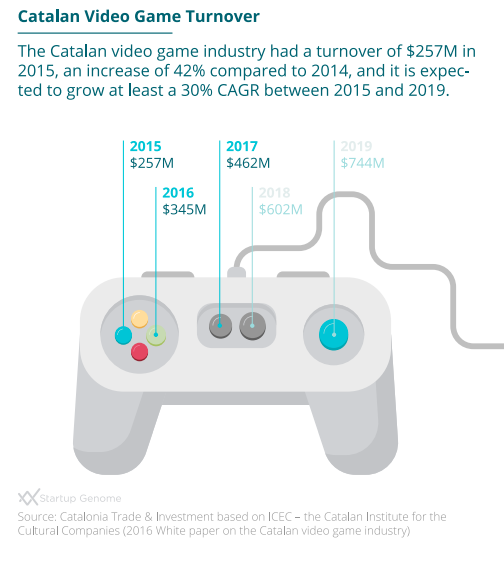 It adds that since 2013, Barcelona has produced an average of one $100+ million dollars exit per year, with the two most recent being Social Point, a gaming company (acquired for $270 million dollars) and Privalia, an online-fashion outlet (acquired for $560 million dollars). “Our global research has shown that such a rhythm of large exits acts as an inflection point in the growth of a startup ecosystem because it “triggers” a higher level of ‘resource attraction’ (entrepreneurs, investors, and talent),” the report expands, which it describes as “necessary” for growth and for other, even larger exits. 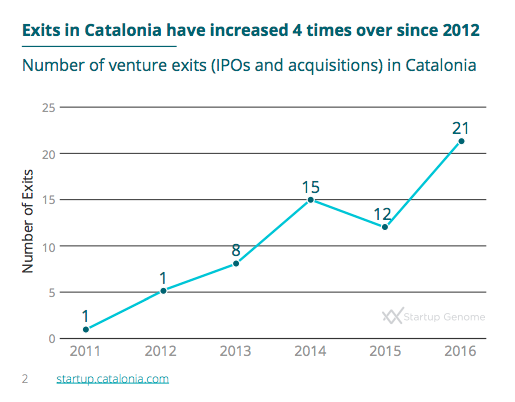 Startup Genome explains that Barcelona, and the region of Catalonia in general, have seen such success because of the emphasis placed on growing the areas where it is already strong, and where it knows its foundational benefits, like global connectedness, will help accelerate development. The company advises that to continue this progress, more funding is needed. What can Canada learn from this? Startup Genome has assessed several Canadian startup ecosystems, including Vancouver, Toronto, Waterloo, Montreal, and Quebec City. Dane Stangler, head of policy at Startup Genome, tells ITBusiness.ca that they all tend to have high rates of startups selling to foreign customers, but need to do to better in selling to foreign customers outside of North America if they hope to continue growth. Selling to foreign customers outside of your continent is key to growth. “On average in Toronto, for example, startups report 42 per cent foreign customers. Once we remove customers on the same continent, however (i.e., the United States), that number plummets for Canadian cities (to 12 per cent for Toronto startups, for example). This latter metric is what we call Global Market Reach: how well are startups able to reach beyond their immediate region?” he questions. However, this is not a Canadian-specific problem, Stangler adds, as European cities – and even Barcelona – face similar challenges. “That’s one thing we see with Barcelona: startups report average 24 per cent foreign customers but that falls to 10 per cent when we exclude Europe,” he says. 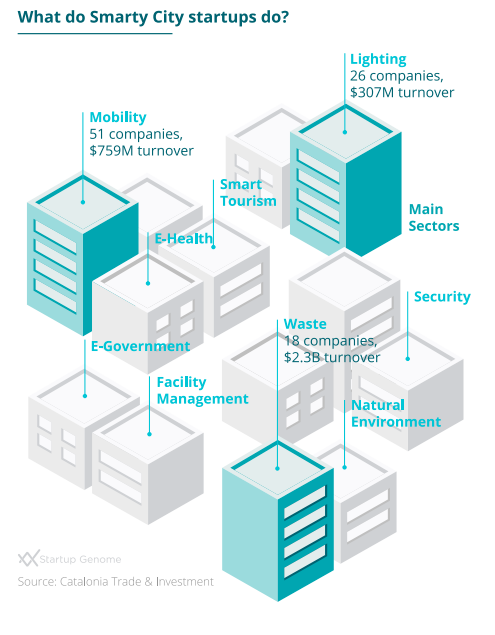 Vancouver is on Startup Genome’s list of startup ecosystems with the most potential. Focusing on areas of strength is one of the key takeaways from this report, Morelix emphasizes to ITBusiness.ca. “Ecosystems should identify the sub-sectors in which they are strongest and prioritize those in both investments and support – leveraging the existing strengths in these sub-sectors as a ‘beachhead’ to help expand and globalize the whole ecosystem,” he concludes.